ORDCO stocks a comprehensive range of base fertilisers, soluble fertilisers, liquid fertilisers, soil conditioners and micro nutrients. 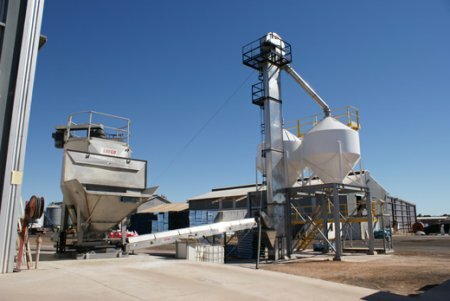 ORDCO has bulk fertiliser storage facilities in Wyndham and Kununurra and has a custom built bulk fertiliser blending facility on site. This allows the capacity to create prescription blends for local growers in a very short time frame. Product is available in bulk, 1 tonne bulk bags or smaller pack sizes. ORDCO has access to a comprehensive range of specialty fertiliser products suitable for fertigation and foliar application. We stock both macro and micro nutrient formulations and source from major suppliers as well as commodity traders. ORDCO stocks an extensive range of liquid fertilisers which can be conveniently used for in-furrow, fertigation or foliar application. In addition to supplying popular liquid products from major Australian producers ORDCO has recently invested in developing its own liquid manufacturing capabilities. This allows the capacity to reduce bulky freight costs and create prescription blends for local growers with minimal lead time. The home gardener can share in the co-operatives buying power in sourcing fertiliser products at farmers prices. ORDCO stocks a range of fertilisers specifically suited to the tropical north.